Anthony Robert Kushner (born July 16, 1956) is an American playwright and screenwriter. He received the Pulitzer Prize for Drama in 1993 for his play Angels in America and then adapted it for HBO in 2003. He co-authored the screenplay for the 2005 film Munich, and he wrote the screenplay for the 2012 film Lincoln. Both films were critically acclaimed, and he received Academy Award nominations for Best Adapted Screenplay. He received a National Medal of Arts from President Barack Obama in 2013. Kushner was born in Manhattan, the son of Sylvia (née Deutscher), a bassoonist, and William David Kushner, a clarinetist and conductor. His family is Jewish, descended from immigrants from Russia and Poland. Shortly after his birth, Kushner's parents moved to Lake Charles, Louisiana, the seat of Calcasieu Parish where he spent his childhood. During high school Kushner was active in policy debate. In 1974, Kushner moved back to New York to begin his undergraduate college education at Columbia University, where he received a Bachelor of Arts degree in Medieval Studies in 1978. He attended the Tisch School of the Arts at NYU, graduating in 1984. During graduate school, he spent the summers of 1978–1981 directing both early original works (Masque of the Owls and Incidents and Occurrences During the Travels of the Tailor Max) and plays by Shakespeare (A Midsummer Night's Dream and The Tempest) starring the children attending the Governor's Program for Gifted Children (GPGC) in Lake Charles. Kushner has received several honorary degrees: in 2003 from Columbia College Chicago; in 2006 an honorary doctorate from Brandeis University, in 2008 an honorary Doctor of Letters from SUNY Purchase College, in May 2011 an honorary doctorate from CUNY's John Jay College of Criminal Justice and also an Honorary Doctorate from The New School, and in May 2015, an honorary Doctor of Letters from Ithaca College. In the early 2000s, Kushner began writing for film. His co-written screenplay Munich was produced and directed by Steven Spielberg in 2005. In January 2006, a documentary feature about Kushner entitled Wrestling With Angels debuted at the Sundance Film Festival. The film was directed by Freida Lee Mock. In April 2011 it was announced that he was working with Spielberg again, writing the screenplay for an adaptation of historian Doris Kearns Goodwin's book Team of Rivals: The Political Genius of Abraham Lincoln. The screenplay for Lincoln would go on to receive multiple awards, in addition to nominations for Best Adapted Screenplay at the Golden Globes and The Oscars. In a 2015 interview actress/producer Viola Davis revealed she had hired Kushner to write an as yet untitled biopic about the life of Barbara Jordan that she planned to star in. In 2016, Kushner worked on a screenplay version of August Wilson's play Fences; the resulting film Fences, directed by Denzel Washington, was released in December 2016. In 2018 it was announced that Kushner was working on a script of a remake of West Side Story for Spielberg to direct. Kushner's criticism of Israel's treatment of the Palestinians and of the increased religious extremism in Israeli politics and culture has created some controversy with U.S. Jews, including some opposition to his receiving an honorary doctorate at the 2006 commencement of Brandeis University. The Zionist Organization of America unsuccessfully lobbied the university to rescind its invitation to Kushner. During the controversy, quotes critical of Zionism and Israel made by Kushner were circulated. Kushner said at the time that his quotes were "grossly mischaracterized." Kushner told the Jewish Advocate in an interview, "All that anybody seems to be reading is a couple of right-wing Web sites taking things deliberately out of context and excluding anything that would complicate the picture by making me seem like a reasonable person, which I basically think I am." In an interview with the Jewish Independent, Kushner commented, "I want the state of Israel to continue to exist. I've always said that. I've never said anything else. My positions have been lied about and misrepresented in so many ways. People claim that I'm for a one-state solution, which is not true." However, he later stated that he hopes that "there might be a merging of the two countries because [they're] geographically kind of ridiculous looking on a map," although he acknowledged that political realities make this unlikely in the near future. Kushner has even received backlash from family members due to his political views of Israel. On May 2, 2011, the Board of Trustees of the City University of New York (CUNY), at their monthly public meeting, voted to remove (by tabling to avoid debate) Kushner's name from the list of people invited to receive honorary degrees, based on a statement by trustee Jeffrey S. Wiesenfeld about Kushner's purported statements and beliefs about Zionism and Israel. In response, the CUNY Graduate Center Advocate began a live blog on the "Kushner Crisis" situation, including news coverage and statements of support from faculty and academics. Three days later, CUNY issued a public statement that the Board is independent. On May 6, three previous honorees stated they intended to return their degrees: Barbara Ehrenreich, Michael Cunningham and Ellen Schrecker. Wiesenfeld said that if Kushner would renounce his anti-Israel statements in front of the board of trustees, he would be willing to vote for him. The same day, the board of trustees moved to reverse its decision. Kushner accepted the honorary doctorate at the June 3 graduation for the John Jay College of Criminal Justice. Kushner was quoted in the 2010 book "It All Changed in an Instant: More Six-Word Memoirs" on page 76. His six-word memoir was "At least I never voted Republican." Slavs! : Thinking About the Longstanding Problems of Virtue and Happiness, Theatre Communications Group, 1995 & acting edition, Broadway Play Publishing Inc.. Terminating, or Lass Meine Schmerzen Nicht Verloren Sein, or Ambivalence, in Love's Fire, Minneapolis, Guthrie Theater Lab, January 7, 1998; New York: Joseph Papp Public Theater, June 19, 1998. "The Secrets of Angels". The New York Times, March 27, 1994, p. H5. "The State of the Theatre". Times Literary Supplement, April 28, 1995, p. 14. "Fo's Last Laugh--I". Nation, November 3, 1997: 4-5. "A Word to Graduates: Organize!". Nation, July 1, 2002. "Only We Who Guard The Mystery Shall Be Unhappy". Nation, March 24, 2003. Gerard Raymond, "Q & A With Tony Kushner," Theatre Week (December 20–26, 1993): 14-20. Michał Hernes, "Kushner: Polityczna dusza Amerykanów została okaleczona" in Kushner: Polityczna dusza Amerykanów została okaleczona, May 17, 2012. ^ "White House to honor Star Wars' Lucas, playwright Kushner among others". washingtontimes.com. ^ Fisher, James (2001). The Theater of Tony Kushner: Living Past Hope. Psychology Press. ISBN 978-0-8153-3150-6. ^ "Sylvia Deutscher Kushner, Bassoonist, 65". The New York Times. August 29, 1990. ^ Miller, Gerri (October 23, 2014). "'Finding Your Roots' explores Jewish genealogy". Jewish Journal. Retrieved June 5, 2018. ^ Harris, Paul (May 5, 2011). "University snub for 'anti-Israel' playwright Tony Kushner". The Guardian. Retrieved June 5, 2018. ^ Berrin, Danielle (November 29, 2011). 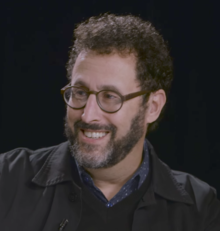 "Tony Kushner awarded $100,000 prize for challenging status quo". Jewish Journal. Retrieved June 5, 2018. ^ Kellaway, Kate (May 14, 2017). "Tony Kushner: 'To love someone puts you at the risk of loss'". The Guardian. Retrieved June 5, 2018. ^ "POMP AND CIRCUMSTANCE". The New Yorker. June 6, 2011. ^ Ithaca College Honorary Degree Recipient Tony Kushner's Commencement Speech. YouTube. May 18, 2015. ^ "Commencement – Ithaca College" (PDF). ^ Yin, Maryann (May 14, 2011). "Steven Spielberg & Tony Kushner To Adapt Team of Rivals". Mediabistro. Archived from the original on April 17, 2011. Retrieved May 5, 2011. ^ SYME, RACHEL. "Viola Davis, on Finding Creative Space in TV With No Limitations". Retrieved August 27, 2015. ^ Lucas, Craig. "Tony Kushner", "BOMB Magazine", Spring, 1993. Retrieved July 25, 2011. ^ Jr, Mike Fleming (January 19, 2018). "Steven Spielberg Eyes Indiana Jones & 'West Side Story' Atop Next Directing Vehicles". Deadline. Retrieved January 19, 2018. ^ Shayndi Raice. "Brandeis graduation honoree draws fire." The Jewish Advocate. May 4, 2006. ^ Cynthia Ramsey (August 24, 2007). "Tony Kushner as film subject". Jewish Independent. Archived from the original on November 7, 2007. ^ Shamir, Shlomo; Mozgovaya, Natasha (May 6, 2011). "CUNY trustee: Kushner must renounce anti-Israel statements to get honorary degree". Haaretz. Retrieved December 26, 2011. ^ Hu, Winnie (May 6, 2011). "After Reversal, Honor Is Likely for Kushner". The New York Times. ^ "Dramatist Alludes to Dispute as He Accepts CUNY Honor". New York Times. June 3, 2011. ^ Lois Smith Brady (May 4, 2003). "Weddings/Celebrations: Vows; Mark Harris and Tony Kushner". The New York Times. Retrieved December 21, 2008. ^ McCarter, Jeremy (May 28, 2009). "Tony Kushner's Day: The playwright at the heart of America's cultural moment". Newsweek. Retrieved May 5, 2011. ^ Stockwell, Anne (October 8, 2012). "Love Stories: Tony Kushner and Mark Harris". Advocate. Retrieved October 12, 2012. ^ Jonathan Kalb (August 6, 2006). "Still Fearsome, Mother Courage Gets a Makeover". The New York Times. p. 2.4. Retrieved December 21, 2008. ^ "Tiny Kushner: An Evening of Short Plays". Guthrie Theater. Retrieved December 26, 2011. ^ Puffin/Nation Prize for Creative Citizenship, official website. ^ "Saint Louis Literary Award – Saint Louis University". Brask, Per K., ed., Essays on Kushner's Angels, Winnipeg, Blizzard Publishing, 1995. ^ Dickinson, Peter (January 1, 2005). "Travels with Tony Kushner and David Beckham, 2002–2004". Theatre Journal. 57 (3): 429–450. JSTOR 25069672.